1. Season the scallops and set aside. Cook the parsnips in boiling salted water for about 12-15 minutes, until tender. Drain and mash with a fork, then set aside. 2. Meanwhile, slice the leeks, wash thoroughly and drain. Melt two-thirds of the butter in a frying pan, add the leeks and cook over a low heat for 7-10 minutes or until soft. Stir in the parsnips, thyme and fromage frais. Season to taste. 3. Heat a frying pan and add the remaining butter. Pan-fry the scallops for 2-3 minutes on both sides or until golden brown. 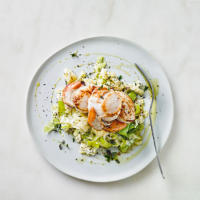 Spoon the leek and parsnip mash onto plates and arrange the scallops on top.